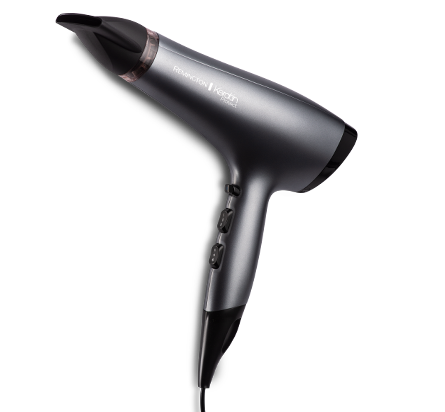 Achieving good hair days has never been easier with the new Remington Rose Pearl Dryer. Housed in elegant Rose Pearl casing this dryer not only looks stunning but also provides fast drying and salon quality results every time thanks to the professional 2200 watt AC motor. 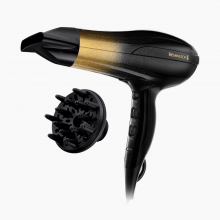 Control and direct air flow easily with the slim concentrator nozzle and diffuser and choose from 3 heat and 2 speed settings to style with, plus a true cold shot to set the finished look in place. Enjoy less frizz and more shine with the ionic conditioning and experience the added luxury of a ceramic coated grille with real pearl. Perfect for creating smooth, head turning styles, the Rose Pearl dryer is a must have for any hair styling tool collection. Housed in elegant Rose Pearl casing this dryer not only looks stunning but also provides fast drying and salon quality results every time thanks to the professional 2200 watt AC motor. Enjoy less frizz and more shine with the ionic conditioning and experience the added luxury of a ceramic coated grille with real pearl.